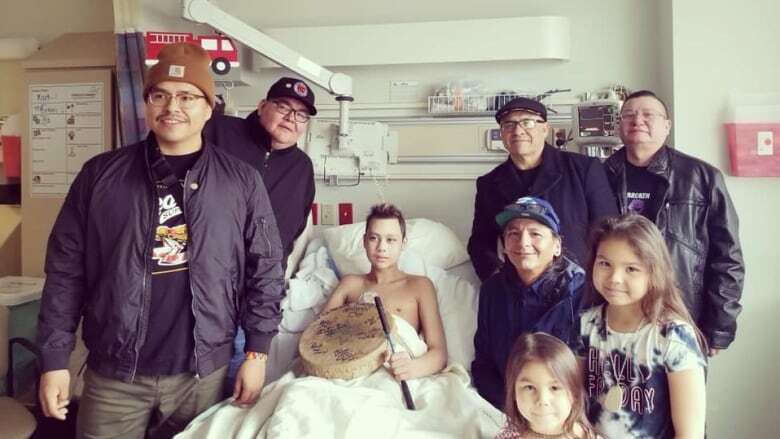 Five members of the 16-person group made their way to London’s Children’s Hospital, where they met with Justice Smith and shared stories, songs and gifted him a drum. Fourteen-year-old Justice Smith cranks up the volume to powwow, drum and singing group Northern Cree every single day. The young professional dancer was over the moon when he learned he would get the chance to watch the Alberta-based group perform on Thursday, March 14, in London, Ont., for Junos week. Days before the show, Justice, who is battling Leukemia, fell ill after a series of harsh chemotherapy treatments left him with painful side effects. "He was pretty upset he couldn't go to the show," his dad, Jay Fastcloud Smith, told CBC. But, the super fan didn't dwell on it for long. His dad attended the show and approached the group backstage. Once Northern Cree caught wind of Justice's story, the group didn't hesitate to bring the show to him. The next day, five members of the 16-person group made their way to London's Children's Hospital, where they met with Justice and shared stories and songs and gifted him a drum. Justice was resting in a hospital bed at about 1:30 p.m. when the group walked in. "He was overwhelmed with joy," said Smith. "He was blown away. He was like 'Wow, they took me in as their brother' … He was just so happy." Northern Cree performed for Justice and taught him a drum song. "It meant more than they'll ever know. It kind of brought me to tears knowing that they came." The interaction was caught on video and shared online, tugging at the heartstrings of hundreds. Justice is expected to come home from the hospital on Tuesday or Wednesday. His dad said the 14-year-old felt a lot better after Northern Cree's visit. "Things are turning around for him. He's sitting up and playing video games," he said. "They … uplifted his spirits." Northern Cree was in the southwestern Ontario city after the group was nominated for Indigenous music album of the year. They did not walk away with a Juno Award but instead discovered another reason they were in the city. "We believe in the creator so we believe that [Justice] is what the creator took us over there for," said group founder Steve Woods. "He touched our hearts"
"Awards come and go. But that is a moment nobody can take away. That was special," he added. He said the group often gets request to meet supporters or sing at birthday parties. "No request is too small or too big. Everyone is very special to us." On Sunday, the group posted about Justice in an online post that received more than 5,000 likes and 800 shares.